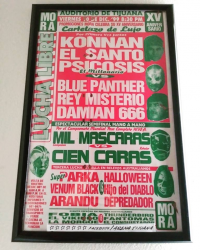 4) Birdman II & Fantomas vs Apóstol Jr. & Trébol Jr. 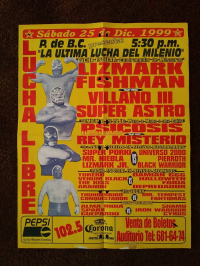 Event Notes: promoter is Sergio Ayup Galindo, this replaced the Arena Olayga show. 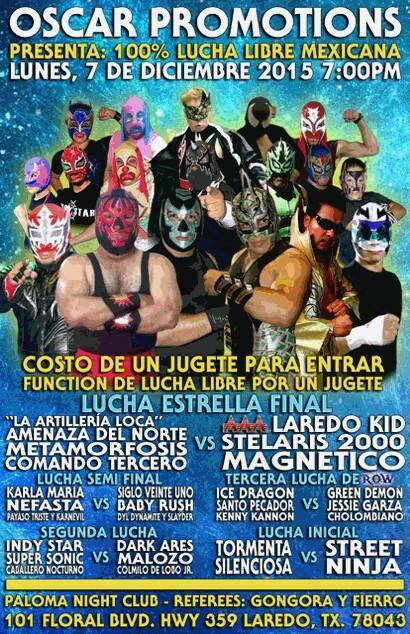 3) El Tackle, Escarabajo, Kain, Tony Rodríguez vs Antrax, Conflictus, Junior Halcón, Stuka Jr.
2) El Genio & Zafiro vs Dany Gardenia & Trébol Jr.
3) Disck Jocker, Gran Davis Jr., Silver Star vs Black Ninja, Piloto Suicida, Stuka Jr.
3) Águila Roja, Baby Olmos, Fantástico I, Fantástico II vs Gran Davis Jr., Gran Jefe II, Gran Jefe II, Gran Jefe Jr.
3) Cavernario Galindo Jr., Diabólico I, Disck Jocker Joe, Pimpinela Escarlata vs Dany Gardenia, Piloto Suicida, Stuka I, Stuka Jr.
match was planned to happen on 11/04, but Espanto was replacd by Ultimo Guerrero for unknown reasons. 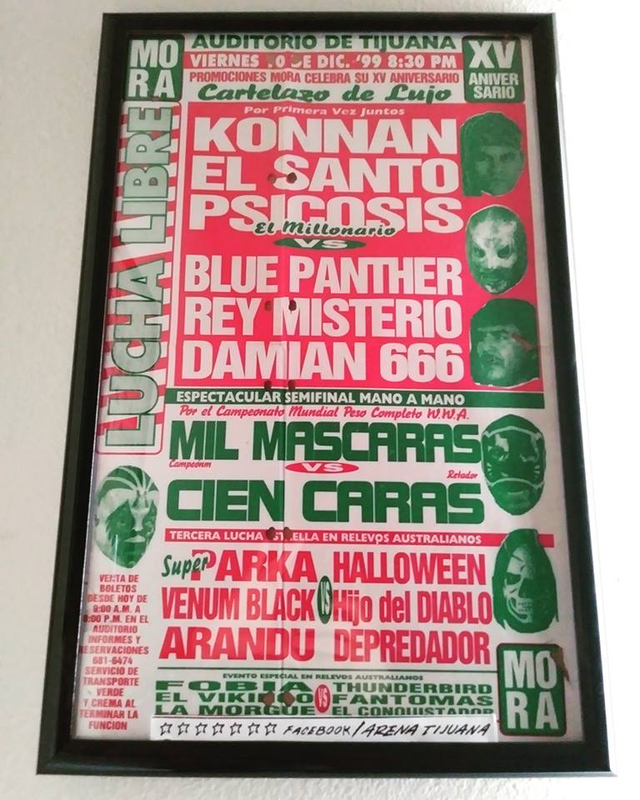 3) Psicosis vs Rey Misterio Sr.
5) Psicosis vs Rey Mysterio Jr.
Cacao is listed as WWA middleweight champion. Tarzan was putting his hair on the line. Angel o Demonio is Hector Perez Gonzalez, 34 years old, from DF, and had been wreslting since 1987. 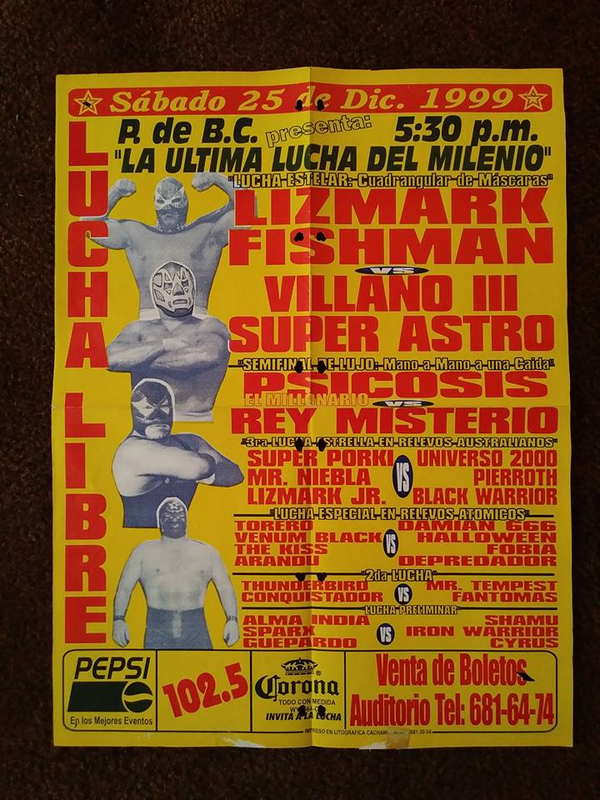 3) Billy Boy, Billy Jean, Luigi Star, Randy Boy vs ?, ? ?, ?? ?, ???? 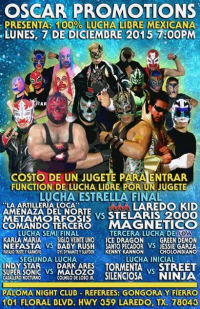 3) Disck Jocker, Mr. Guerrero, Scriba, Último Rebelde vs Black Ninja, Star I, Star II, Stuka Jr.